Lock in a great price for Eva's House – rated 9 by recent guests! Location, cleanliness, comfort, quiet, pretty much everything. The manager of Eva's House is friendly and helpful. We greatly appreciate that! Nicely decorated cave room with everything you will need. Eva's House is extremely charming and Eva is the most wonderful host! We had the room #6 for 2 nights. The room was super clean and it is very quiet during night. Eva's house was the perfect place to stay! The location was walking distance to the main streets of Fira. The room was cozy and clean with a view of the ocean. Eva was the most amazing host! She's super sweet, friendly, and extremely attentive to all her guests. She goes above and beyond to take care of everyone. I will definitely be coming back to Eva's House! Excellent owner . Very comfortable stay. 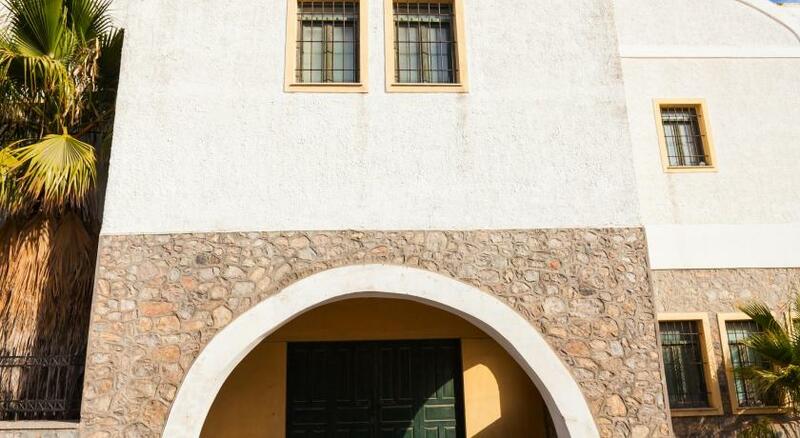 Closes proximity to Fira market and bus station. Arranged for quad and airport drop at cheapest rates. The rooms are spacious very clean. Bathrooms are nicely maitianed & has excellent upkeep. I'll recommend it to anyone for a short/long stay. The location, close to the centre of Fira, but in a quiet area. Eva is a very friendly and welcoming lady. The place looks very modern. One of our best sellers in Fira! Set in Fira, 2,300 feet from Archaeological Museum of Thera, Eva's House features air-conditioned rooms and free private parking. The rooms have a flat-screen TV. A terrace or balcony are featured in all rooms. Rooms are equipped with a private bathroom. Eva's House features free WiFi throughout the property. Museum of Prehistoric Thera is 1,000 feet from Eva's House, while Megaro Gyzi is 2,300 feet from the property. The nearest airport is Santorini (Thira) Airport, 1.9 mi from Eva's House. When would you like to stay at Eva's House? This double room features a balcony or terrace, tile/marble floor and air conditioning. Please note that smoking is strongly prohibited. House Rules Eva's House takes special requests – add in the next step! Eva&#39;s House accepts these cards and reserves the right to temporarily hold an amount prior to arrival. Eva's House accepts these cards and reserves the right to temporarily hold an amount prior to arrival. Please inform Eva's House of your expected arrival time in advance. You can use the Special Requests box when booking, or contact the property directly using the contact details in your confirmation. 1) We ran out of hot water in the shower. 2) No shower curtain/door, causing wet bathroom floor. If you wish to spend time in Oia to see the magnificent scenery and famous sunset you will need a car or public transport. We arrived late in the evening after a late flight. Eva greeted us at the accommodation and when she realised that we hadn't had dinner she prepared a small platter and some wine for us. New building, very clean and spacious. Fantastic for this location. Eva has an arrangement with local restaurants whereby they do delivery free meal deliveries to the accommodation. Bed was a little firmer than we are used to. Eva was a beautiful friendly host. Extremely clean rooms. Lovely quiet location to stay. I’m a pregnant person and the uphill walk to the centre was a little hard work. The location wasn’t the best, 10 minute walk to Fira up a hill, not the best when it’s hot and you’ve got luggage! I would suggest renting a car if you stay here, there’s good parking. The room lacked a safe and there was no bin! It was also quiet noisy, you could hear everything from the other rooms. We were given no checkout information or any help getting to the airport when we left. The room was lovely, very clean and spacious. Good price when you compare to other hotels in Fira (probably due to location), however we stayed in Kamari for a few days before here and got much more for our money! Wouldn’t recommend Fira but Eva’s house was nice. A bit of a walk, about 10 minutes on a steep uphill, to get to the buzz of Fira Town. Slightly inconvenient getting to and from the property with luggage considering the central Fira bus station is 850m away (I paid €10 for a taxi to the bus station as I couldn't pull my 17kg suitcase up the hill), but for day to day getting around it's a good bit of exercise. Bed was quite hard and the 6 rooms are very close together with minimal soundproofing but I got used to it after the first night. Rooms are minimalist but spotless, modern decor and beautiful. Great, modern bathroom and lovely little patio to enjoy the evenings. Eva is WONDERFUL, so hospitable and endearing! Convenient and well priced for central Fira despite the uphill walk. Would recommend. FYI - local bus to/from port is only €2.30, reliable and convenient. I'd definitely recommend it vs €25 transfers. Cozy room and beautiful and spacious bathroom. Very clean, modern rooms and staff is the best. Eva is the best host you will ever have, always ready to help! No pool. The powerpoints are in weird places so I had to use my straightener in the bathroom mirror plugged outside the bathroom door. The water from the tap and shower tasted weird so I started brushing my teeth with bottled water. The sheets and blanket feel stiff and the pillows were uncomfortable. Eva was a little full on when we arrived as I was feeling unwell and didn’t want my boyfriend to leave me to get the quad bike but she was pushy about it, plus the one she got us was €120 for 3 days and our friends got one for 3 days for €26 a day. So that wasn’t a good feeling after knowing we paid so much more. The view from our room was a car park. The bathroom smelled and took a long time to air out. The room was nice don’t get me wrong but with all these little things we didn’t like, to pay €363, it’s just too much for what we got in return. We booked two nights at another place with a pool and amazing mountain views for just €163 so are disappointed we booked at Eva’s. I liked the fact the room was cleaned and bed made every day. I liked having tea and coffee available. The clothesline outside was good too. Air conditioner was powerful and appreciated. Eva organised a quad bike for us within minutes of arrival. The dog Lucy was sweet. We were close to town but I wouldn’t walk it. I was feeling unwell so Eva brought juice and two cake slices to our room. So thoughtful. Eva also kept asking how I was feeling which was kind. Room, bathroom and good value for the money.